Inspired by the unique and expressive works of Matisse, the Shabbat Light Ketubah exhibits tons of color and a beautiful design. 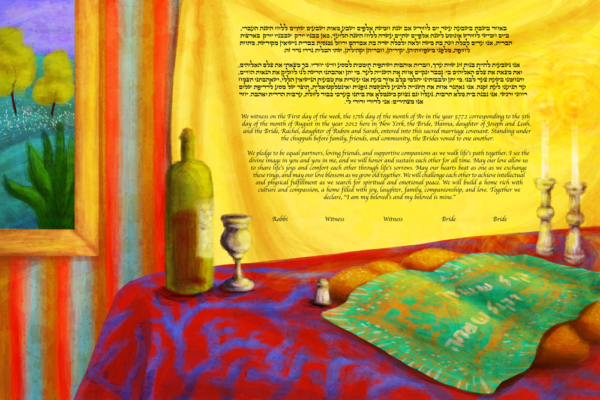 This Ketubah shows the traditional Shabbat table with candles, wine, and of course, challa bread. The bright yellow back drop adds just enough light to really illuminate the text. The Shabbat Light Ketubah is radiating with deep-rooted tradition and reverence. A beautiful representation of a new life and home you will create with your partner, this Ketubah is perfect for the couple that wants a bold work of art with a modern style. The glow of the candles will not only remind you of the importance of tradition, but also of the deep bond and love you share, forever.